On the day after the Rohatsu Sesshin, Charles Wolf Drimal and Leigh Mills received the precepts and entered the lineage in a Jukai Lay Ordination Ceremony with Zenki Dillo Roshi. Wolf received the Buddhist name Myozan Montetsu (Wondrous Mountain Gate Penetrate). He lives in Bozeman, Montana, with his wife Shana, his son Elias, and his newborn daughter Kestrel who all attended the ceremony. Wolf is a professional mountain guide and currently works on river conservation in Greater Yellowstone Area. He co-leads CMZC’s Wild Dharma Practice with Zenki Roshi: one trip into the Dirty Devil Canyon in Utah and one into the Sangre de Cristo Mountains above the Center. Leigh received the Buddhist name Jikai Seiryu (Compassion Ocean Energy Dragon). She lives across the valley on an off-grid homestead near Saguache. 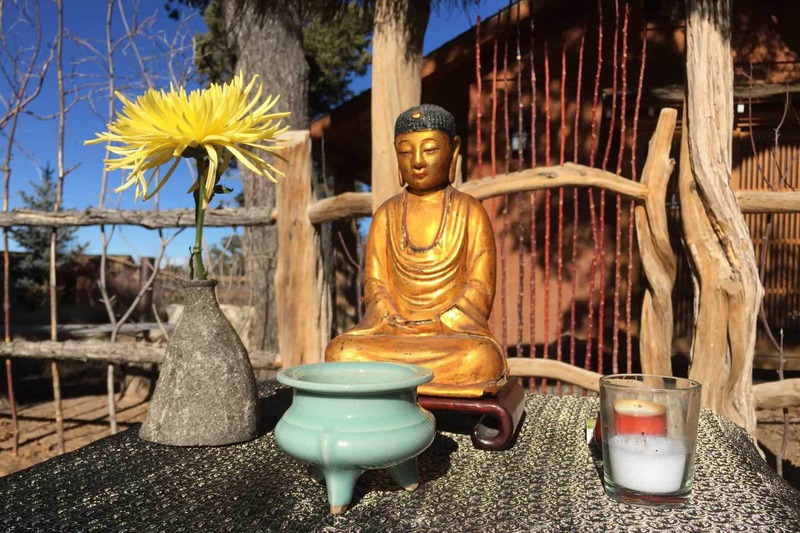 She practices regularly at Crestone Mountain Zen Center and generously helps CMZC with gardening, kitchen work, and ongoing maintenance. Her participation has been particularly important during the summer months when CMZC is focused on the Summer Group Guest Season. Thank you, Myozan Wolf and Jikai Leigh, for committing yourself to Buddha, Dharma, and Sangha. We look forward to continuing our practice with you!